Hi! I'm a mountain goat. Actually, I'm a goat-antelope, and the most sure footed of beasts, as my name suggests. I live in the highest peaks, from the mountains of Alaska to the Rockies. My beard and long, warm coat protect me from cold temperatures and biting mountain winds, while my dazzling white color provides good camouflage on the snowy heights. Did you know that I can leap nearly 12 feet in a single bound? 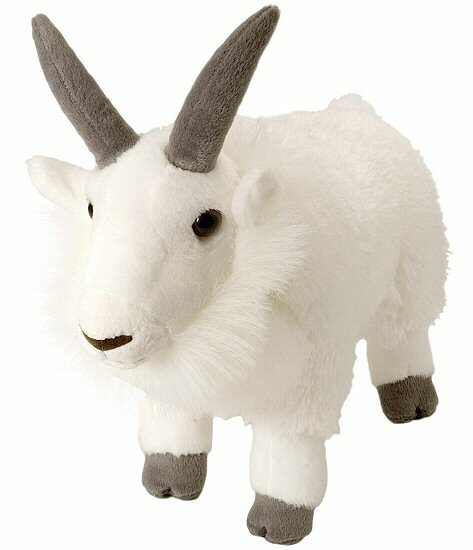 A portion of the proceeds from the sale of this majestic Cuddlekins stuffed mountain goat helps to provide housing and education for disadvantaged children, as well as protection for abandoned animals throughout the world. Complete with stately gray horns, this adorable Mini Cuddlekins stuffed mountain goat is a cuddly stunner. This little plush goat is adorably unconventional with a huggable square body and soft cream fur. This adorable plush goat has a cuddly body of soft gray fur, black "socks" above dark gray hooves, and sweet face. This sweet busy beaver has a wonderfully cuddly body with super soft fur and fun felt teeth.